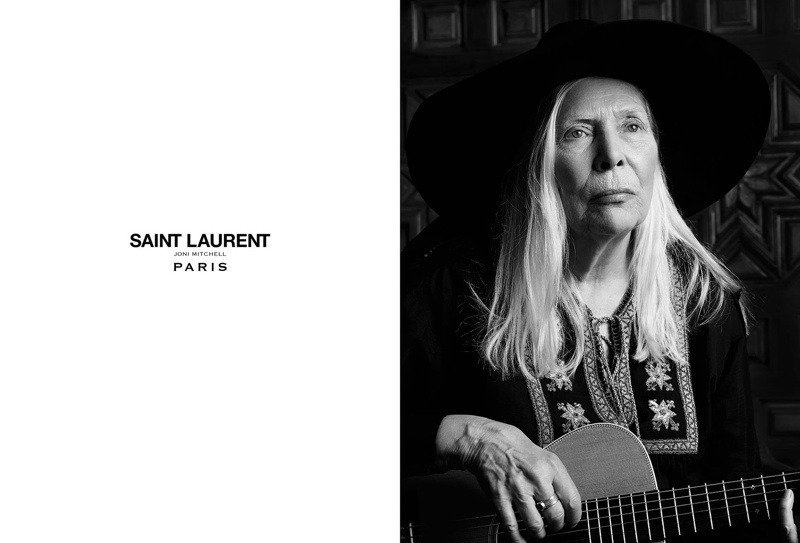 Can we talk about... that Joni Mitchell x Saint Laurent campaign? We really have to talk about this one. I mean, Saint Laurent is my 'one day when I'm rich and famous I'll own every item' aspirational high-end label. For me, they just continue to get it right every single season. This season I was truly heartbroken I didn't have the pennies for their signature glitter ankle boots. My toes shall just have to remain glitter-free for now... Staying true to their 70's throwback inspired designs, Saint Laurent have picked the ultimate front woman for their SS15 campaign, lady Queen Joni Mitchell herself. Obviously Joni was a prominent figure of the decade that has influenced Saint Laurent designs, so the two are a match made in heaven. The Canadnian singer-songwriter was shot by SL's creative genius, Hedi Slimane, whilst wearing a Saint Laurent folk tunic teamed with a staple fedora and a custom made leather cape. If I can look as damn cool as Joni at 71 years old then I'll be a happy woman. Saint Laurent have featured a number of musicians in previous campaigns such as the likes of Courtney Love and Marilyn Manson, so I can't wait to see who Hedi has in mind for their next campaign. I vote Stevie Nicks, please and thank you. What do you think of Saint Laurent's latest campaign?